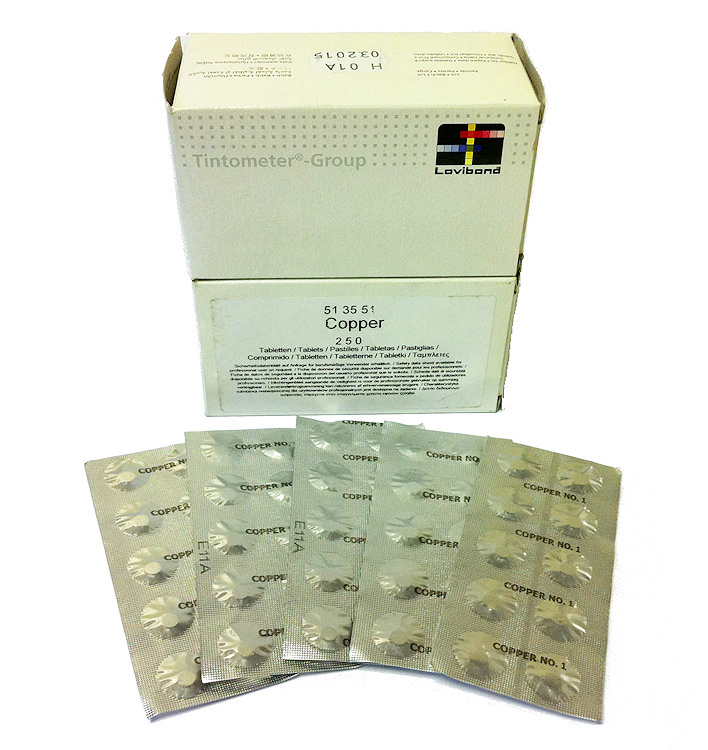 Lovibond Copper Test Tablets - Available in No.1 & No.2 - Photometer or Comparitor tablets - Tests water for Copper levels. In unbalanced water, copper may drop out of solution and cause staining of a pools submerged fixtures and pretty much all of its non-metal surfaces (i.e. vinyl liner, fiberglass bottom, concrete/gunite bottom, etc.). Typically a severe drop in alkalinity and/or pH can result in copper staining with the right amount of free dissolved copper present. A second source of copper, and also a good reason to test for copper in pool water every once in a while, has to do with the pool owners choice of algaecides. Some of the algaecides on the market contain trace amounts of copper due to coppers ability to effectively fend off an outbreak of algae in water whose chlorine or other oxidizer level has dropped. Long-term use, or most often improper overuse, of copper-based algaecides can lead to an excessive buildup of copper in the water. A severe change in alkalinity and pH, possibly as a result of a rainstorm or the addition of new water to the pool, may cause that copper to come out of solution and cause staining on the surfaces mentioned earlier.